You have a number of consumer rights if you are facing harassment or abuse from a debt collection agency. It is against the law for collection agencies to harass you. There is a federal fair debt collection practices law and similar laws in most states. In some cases, state laws are more powerful than the federal law. One of the most important protections in the federal fair debt law is your right to send a letter and request that a collection agency stop contacting you. There are no magic words that you must use, but the request must be in writing. It is a good idea to keep a copy for yourself, send it by certified mail, and get a receipt. 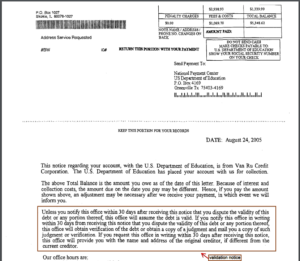 Once you send the letter, the loan holder can still sue you, but it can no longer send letters or call you. You can use these self-help packets in English and Spanish to help you write this “cease communication” letter. 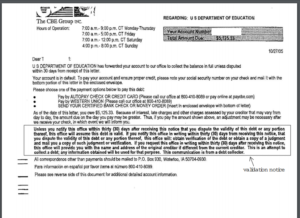 The CFPB also has sample letters you can use to respond to a student loan debt collector. No communication is allowed at any unusual time or place. In the absence of other information, the law assumes that after 8:00 a.m. and before 9:00 p.m. is the only admissible time. Make intimidating statements such as threats to investigate you or telling you that you should not have children if you can’t afford them.